Do YOU have a working Carbon Monoxide Alarm in your Home as well as a working Smoke Alarm on each level? If Not, Why Not? Smoke alarms are mandatory - it's the law! The 1997 edition of the Ontario Fire Code contains changes making Smoke Alarms mandatory in every dwelling unit. The landlord is responsible to install and maintain these devices. Smoke alarms should be installed on every level of your home, including outside sleeping areas. Because smoke rises, you should place alarms on the ceiling. If you cannot do this, place them high up on a wall (25 cm or 6" below the ceiling), according to manufacturer's instructions. There are certain locations to avoid such as near bathrooms, heating appliances, windows, or close to ceiling fans. Test your alarm on a monthly basis by using the alarm test button or by introducing smoke from an incense stick or smoldering cotton string. Follow your owners manual. Change your batteries on an annual basis, and remember to have and practice a Family Escape Plan. Recently there have been concerns about the reliability of popular Ionization type smoke alarms. Issues have been raised about how quickly they will actually detect smoke from a smoldering fire such as that from a cigarette dropped into furniture, and sound an alarm. Ionization type will detect fast flaming type fires such as that normally encountered in a house. Photoelectric type will detect smoldering type fires such as those encountered with careless smoking. Since no one can predict the type of fire that will occur, it is difficult to recommend which is best. Fire safety can be enhanced by installing both types. Q: What is the lifespan of a typical household smoke alarm? A: Smoke alarms don't last forever. (this emphasizes the importance of having more than one smoke alarm) According to manufacturers guidelines, smoke alarms should be tested weekly and replaced when they are ten years old. Replace the smoke alarm when it does not test properly. Clean and care for the alarm as described in the owners manual. Q: What locations in homes should be avoided when installing smoke alarms. A: Manufacturers state to avoid locations where smoke may not reach the alarm in time to provide early warning, or where the alarm may not be effective. In or near turbulent areas of your home such as doors, windows, fans etc. In or near dead air space such as the peak of an "A" frame ceiling. In rooms with simple sloped, peaked or gabled ceiling, install smoke alarms on the ceiling 90 cm from the highest point. In or near very hot or cold areas where the temperature exceeds 38C (100F) or falls below 5C (40F).Less than 25 cm (6 in.) from the wall when mounted on the ceiling. Q: In what rooms should a smoke alarm NOT be located? A: In the bathroom. High humidity can interfere with the sensing chamber. In the kitchen. Normal cooking will activate most smoke alarms. Q: Where should smoke alarms be located in the home? A: Smoke alarms must be located on each floor level, between the sleeping area and the remainder of the dwelling unit. Carbon monoxide alarms are mandatory. Only carbon monoxide alarms bearing the new Canadian Standards Association ULC/CGA-6.19 standard are recommended by the Carbon Monoxide Awareness Committee. The unit may also have a battery back-up. 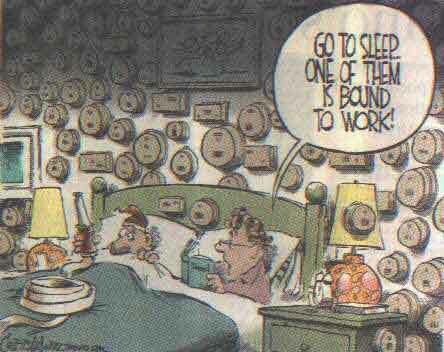 At least one CO alarm should be installed adjacent to the sleeping area of your home. You may need more than one CO alarm if sleeping areas are located on different levels. And remember to test the unit every month. Please refer to the manufacturers instructions for details about installation, proper use and maintenance. The use of CO alarms that meet these standards can warn you about sudden failures of fuel-burning appliances and are a good second line of defense against CO exposure in you home, cottage and recreational vehicle. The best way to prevent carbon monoxide poisoning is to ensure all appliances are well serviced and maintained. Have your furnace and chimney serviced regularly. Don't leave automobiles running in the garage, use barbecues outside only, and operate all gas powered equipment outdoors, in well ventilated areas. CO alarms are not a substitute for maintenance by a qualified technician, and safe use of this equipment can help prevent a carbon monoxide hazard. For age 65 and older, the fire fatality rates are more than twice the national average. For those over 75 they jump to three times the national average, and for those over 85 they are four times the national average. Three of the leading causes of home fire deaths for older adults are smoking accidents, faulty or misused heating equipment, and cooking accidents. Many of these deaths could be prevented. Smoke alarms cut your risk of dying in a home fire in half. You can cut your risk even more by practicing fire safety and by developing and practicing a home escape plan. Have a smoke alarm on each level and outside each sleeping area. Have a Carbon Monoxide detector outside each sleeping area. Replace batteries yearly. (a birthday or the date we change our clocks is easy to remember) or sooner if a chirping sound indicates low power. Keep glasses, a telephone and walking aids by your bed. In the event of fire use the stairs, don't use the elevator. Don't open a door that is hot to the touch, use your alternate exit. If you must escape through smoke, crawl low where it's easier to breath. If your clothing catches fire "STOP - DROP - AND ROLL." Never smoke in bed or when sleepy or drowsy from medication. Use large ashtrays with a center support to hold cigarettes. Don't set ashtrays on the arms or other unstable surfaces. Empty them into a metal container or douse them with water. Check upholstery and carpet for ashes that could ignite. Keep portable and space heaters at least 3 feet from any combustibles. Be sure wiring is adequate for electric heaters. Don't overload circuits or rely on extension cords. Don't store or dry objects on or near heaters. Wear clothing with close-fitting sleeves to prevent clothes from catching fire. Store needed items where you can get them without reaching over the burners. Use a timer to remind you when something is finished cooking or needs attention. If you are interrupted while cooking, turn off the burners. Take a pot holder or other kitchen item with you to remind you to resume your task at the stove or check the oven. Use pots and pans that are easy to lift. Turn handles of pots to the side so they're not easily upset. Turn off the burner before picking up a pot and use a pot holder. Heat oil gradually so it won't spatter and always clean up any spills. If the pan catches fire slide a lid over it and turn off the burner. Use cool water for 10-15 minutes, then a bandage on minor burns. If a burn is serious call for help. If clothing catches fire "STOP, DROP AND ROLL." To Go?? or To Stay?? Q: Some information I have read tells me to evacuate immediately in case of fire. Other information says that I will be safer if I stay in my suite. Which is correct? A: To go or to stay ... the decision is yours. Each option involves a major commitment on your part. Your choice will depend on the circumstances at the time of the emergency. You should understand the consequences of this important decision. Most of the time, the best thing to do in a fire is leave the building as soon as possible. If you let this opportunity pass, you must be prepared to protect yourself from smoke and other effects of fire until you are rescued or told by the fire department that it is safe to leave. This may take a long time and the conditions in the building may deteriorate. Do not try to leave your suite a long time after the fire alarm has sounded. The longer you wait to evacuate, the more risk there is that heavy smoke and heat will have spread into the stairways and corridors. Your chances of survival are significantly reduced. The following information will help you to make the right decision and to develop a personal fire emergency response plan ahead of time. Q: When should I stay in the suite? Q: What else can I do to prepare myself before a fire emergency occurs? A: Become familiar with the fire safety features provided in your building. For example, the effects of fire will be significantly reduced in a fully sprinklered building. This is an important consideration if you are unable to use stairs to evacuate the building during a fire emergency (e.g. physical disabilities, medical condition, etc.) or where the fire department has limited capacity to carry out rescue. Learn the location of the exit stairways and practice using them. Know which floors you can use to cross from one stairway to another. Familiarize yourself with the fire alarm signal. Identify the location of fire alarm manual pull stations and read the instructions about how to operate them. If your building has a voice communication system, learn how it will be used by supervisory staff during an emergency. Get a copy of the fire emergency procedures from your building management and read them carefully. They may also be able to provide you with other important information. Keep this material in a prominent place and review it periodically. Contact your fire department for more information or to request a fire safety presentation for all residents. Q: How can I identify the location of a fire when I hear the fire alarm? A: In some buildings, the fire alarm system may have different tones (evacuation and alert signals) which will assist you to identify when immediate evacuation is required for your floor. If the building is equipped with a voice communication system, supervisory staff may be appointed to provide information on the location of the fire to the building occupants. Find out if these features apply to your building by becoming familiar with the building fire safety plan and emergency procedures as discussed above. Q: What actions can I take to protect myself from smoke entering the suite during a fire? Make sure that you have a roll of duct tape readily available. Duct tape can be purchased in most hardware stores. Use duct tape (masking tape may also be effective) to seal cracks around the door to your suite and place wet towels at the bottom. Seal vents, air ducts and other areas where smoke is entering the suite in the same manner. If the suite fills with smoke, move to the balcony (if you have one) and close the doors behind you. Take a cordless or cellular phone with you if available. Call the fire emergency number and provide details of your situation. Also, take warm clothes or blankets if the weather is cold. If you do not have a balcony, go to the most smoke-free room, close the door and seal it with tape and towels. Open the window for fresh air but be prepared to close it again if this makes the conditions worse. Never break the window to get fresh air or you will not be able to seal it off if conditions change. Q: I have read that most people die trying to evacuate during a fire. Is this true? A: Experience shows that people who evacuate in the early stages of a fire can safely reach the outside. Most people die because they attempt to leave the building through smoke-filled corridors and stairs in the advanced stages of a fire. Although the conditions are different for each fire, this could occur as early as 10 minutes after the start of the fire. If you made the decision to stay in the suite during the fire emergency, do not change your mind and attempt to evacuate later. Please refer to question No. 1 for details of when evacuation is and is not appropriate. If you encounter smoke during evacuation, look for an alternate route that is clear of smoke, return to your suite or seek refuge with other occupants on the nearest floor. Do not use the elevator for evacuation (except under direction of the fire department) and never go to the roof since it is not designed as an exit. A: Many people are reluctant to evacuate unless they are certain that there is a real fire. This problem is made worse by nuisance alarms. Remember, a real fire grows for every minute that you delay and you may lose the only opportunity to evacuate safely. For this reason, all occupants who are able should begin evacuation procedures immediately upon hearing the alarm. If you made an initial decision to stay in your suite when a fire emergency occurs, do not attempt to evacuate in the advanced stages of the fire. You cannot outrun the effects of fire and smoke and will be placing yourself in extreme danger. Each suite is designed as a fire compartment and will afford you a degree of protection during the fire emergency. However, smoke spread into your suite is very likely, so be prepared to protect yourself from smoke for the duration of the emergency. This may be a long time.